M.A. digital image & virtual reality, candidates. Arts et Technologies de l'Image, Université de Paris 8, France. modular architecture, interactive visit, perceptions, orientation. Originally inspired by an Op’art figure: M. C. Escher, RubikHome is a virtual environment which asks the way users can appreciate an immaterial space through their senses. The idea was to make responding the virtual space while user moves on it. In order to use no psychedelic effects, we preferred handling the architecture and the evolution of the objects which compose this environment. The main concept of how architecture can influence the perceptions is also directly inspired by Haus-Rucker-Co, an Austrian art/architecture collective inventor of inflatable structures where two peoples can immerse themselves. This kind of structure can modify perceptions of the close environment, like living in our own little world. The concept of this collective also guides the global style of the application. During the modelling phase of our virtual objects database (fig. 1), we’ve remembered the “look&feel” of furniture’s catalogues: we had to think about what kind of rendering solutions we should opt for, in order to keep a certain uniformity. The choice of the orange was made according to the symbolism of the color: in a common (and subjective) sense, orange is active and invigorating, arouses the senses, heightens the emotions and causes a feeling of good mood. Associated with the white and combined with sixties patterns, we try to contrast with the usual “sanitized” aspect of flat or raw 3D style. Modelling using low polygon techniques with Autodesk 3ds Max, an edging colorization associated with ambient occlusion shadows stylise the objects (a real-time SSAO shader could be integrated in a further development). The real-time 3D engine used is 3DVIA Virtools. About the interface, the interactive visit is experienced through a stereoscopic HMD with infrared tracking and a mouse for navigation. Figure 1: collection of objects used in the virtual space and stylized rendering. While some objects keep the same positions, walls can also rotate: the visitor knows the space and can remember elements which compose it, but several one’s are replaced. In concrete terms, an object takes the place of a previous one: we visit a place known at the same time and in constant mutations (fig. 2). The All Seeing Eye provides a similar disturbing experience, while the rotating panorama of a living room, each time a rotation is completed, some objects of the room have disappeared and this until the entire room became empty. The way we can interact with elements is minimalist: inspired by the installation The Wave, only the presence of the user triggers the “composition”, like this, there is a body approach: our own movements affect both the look of the wall-structure, the furniture and their sounds. The change is gradual and follows the place of the viewers’ stride, and this merging generates a certain fascination: we control something that looks untameable. This disconcerting visit immerses the user who uses his sight and hearing senses, while we use the virtual avatar kinaesthesia to interact. Moreover, the spatial memory is called during the navigation. We can feel destabilized without being lost using an allocentred spatial representation of the environment. In concrete terms, without real references with his physical body, the user has to use a mental simulation of the displacements based on the relation between the objects (and their sounds). It forces to remember the places, and here are the objects without referring our virtual body. Geometry and virtual space are here manipulated by the memory using perspective notions and the field of view, in an immaterial space. This space is however delimited by the volumes (volumetric shadows on the white objects and their border colorization). The global feeling is disconcerting: we globally know and remember the virtual space, while it keeps evolving. Also the specific sounds attached to elements make user feeling present is an electronic score illustrated by the modular architecture. 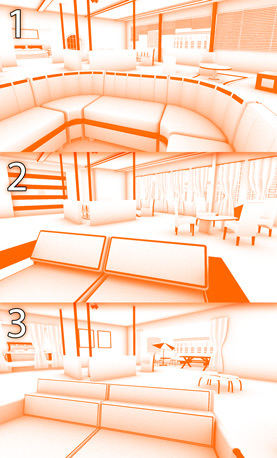 Figure 2: three different visions of the same place where objects alternate and the global architecture rotates. Rubikhome could be associated with other domains like architecture: singular kind of interactive design pattern, interactive visit, or quick prototyping in real-time. Or in a different field, for example, medical applications: self positioning and memorizing environment (Alzheimer's disease) could permit practising and training for rehabilitation in neuropsychology. 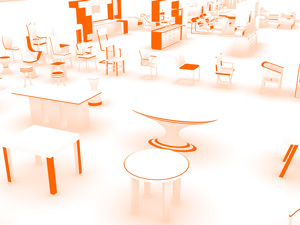 Finally, in the marketing field: for furniture choice and space positioning in an interactive catalogue, web applications or product demonstrations.